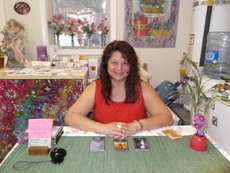 Her weekly Thursday “Be an Everyday Mystic” classes at Angel Light Books are designed to strengthen students’ psychic and intuitive skills and apply them to daily practical life. Available Tuesdays from 8 a.m. to 5 p.m./ Thursdays from 1 p.m. to 5 p.m. and Fridays from 5 p.m. to 9 p.m.
For a 15 min reading $35, 30 min reading $65, 60 min reading $130. To pay for an appointment, you need to make 2 transactions. 80% to the consultant and 20% to Angel Light.